Medical Sciences University, Kashan Medical Sciences University, Kashan, Iran. Received July 11th, 2011; revised August 15th, 2011; accepted September 23rd, 2011.
others (41.6%). 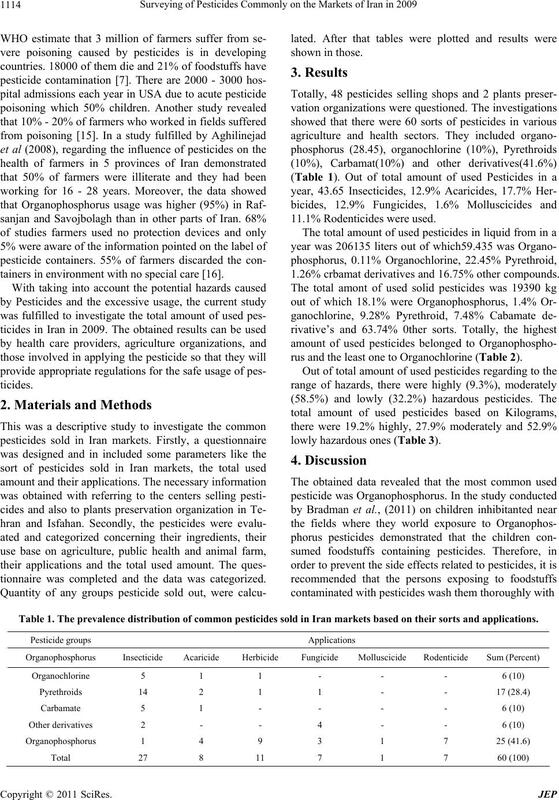 The common est pesticid e used in a yea r was O rgano phosph o rus and th e least on e was Organoch lorin e.
pesticides, the protection strategies and the pesticides hazards on users. disturbanc es [4 ] . 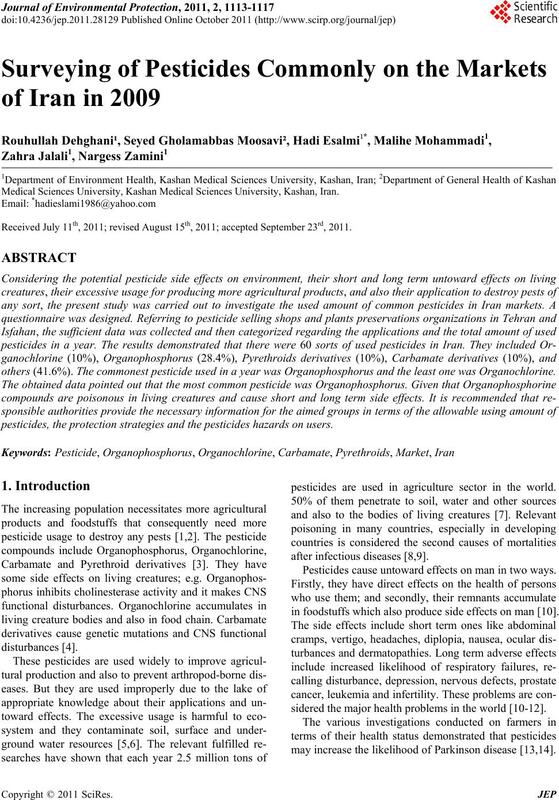 pesticides are used in agriculture sector in the world. Pesticides cause untoward effects on man in two ways. in foodstuffs which also produce side effects on man . sidered the major health problems in the world [10-12]. may increase the likelihood of Parkinson d isease [13,14]. tainers in environment with no special care . tionnaire was completed and the data was categorized. 11.1% Rode nt i c i des w ere us ed. 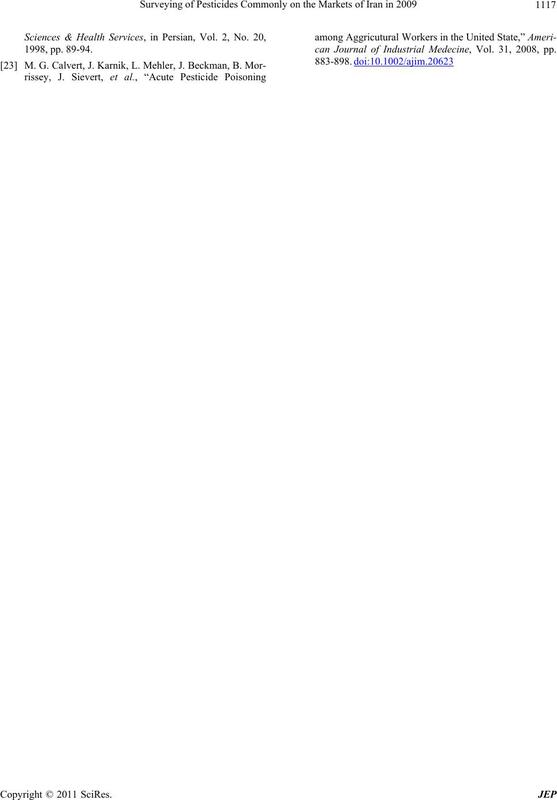 1.26% crbamat derivatives and 16.75% other compounds. rus and the least one to Organochlorine (Table 2). lowly hazardous ones (Table 3). Table 1. The prevalence distribution of common pesticides sold in Iran markets based on their sorts and applications. Table 2. The prevalence distribution of sold pesticides in Iran markets according to the used amount per a year. Table 3. 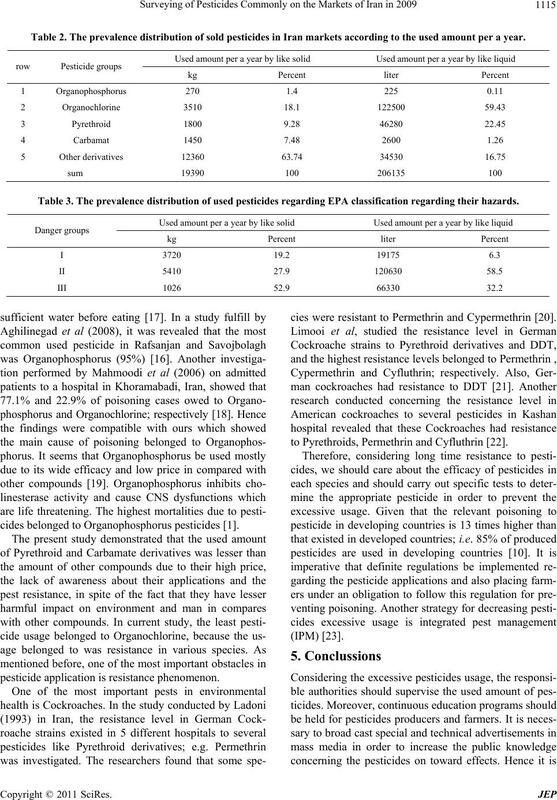 The prevalence distribution of used pesticides regarding EPA classification regarding their hazards. cides belonged to Or ganophosphorus pestic ides . pesticide application is resistance phenomenon. cies were resistant to Permethrin and Cypermethrin . to Pyrethroids, Permethrin and Cyfluthrin . involved in app lying those. Conference, Tehran, Iran, 2010, pp. 807-815.
nology, Vol. 7, No. 2, 2010, pp.175-82. WHO Expert Committee on Insecticides, Geneva, 1973.
nal of Pharma and Bio Sciences, Vol. 1, No. 4, 2010, pp. G. V. R. Rao, K. l. Sahrawat, C. S. Rao, B. Das, K.K. Development, Vol. 24, No. 2, 2009, pp. 21-27. Persian, Vol. 6, No. 2, 2000, pp. 50-58.
ment International Journal, Vol. 31, pp. 687-692.
velopment, in Persian, Vol. 23, No. 1, 2009, pp. 28-40. Vol. 7, No. 13, 2007, pp. 1-7. Vol. 53, No. 1, 2009, pp. 69-81. F. Kamel, C. M. Tanner, D. M. Umbach, J. A. Hoppin, M.
Health Study,” American Journal of Epidemiology, Vol. J. A. Firestone, T. S. Welle r, G. Franklin, P. Swanson, T.
Parkinson Disease,” American Medical Association, Vol. cal Science, in Persian, Vol. 31, No. 4, 2008, pp. 327-331. A. Bradman, R. Castorina, D. Boydbar, J. Chevrier, M. E.
Public Health, Vol. 8, 2011, pp. 1061-1083. Sciences, in Persian, Vol. 10, No. 1, 2008, pp. 3-10. Vol. 6, No. 1, 2008, pp. 75-82. Vol. 12, No. 13, 1993, pp. 23-28.
ences, Vol. 6, No. 2, 2006, pp. 382-387. 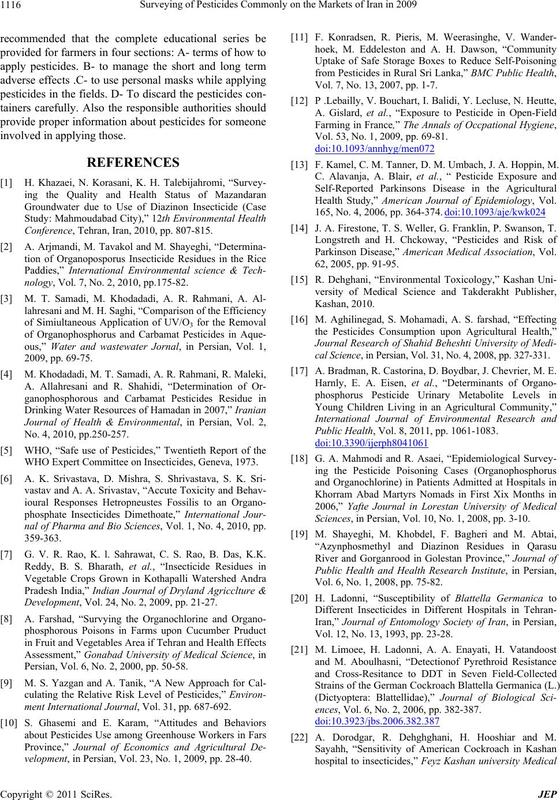 A. Dorodgar, R. Dehghghani, H. Hooshiar and M.
can Journal of Industrial Medecine, Vol. 31, 2008, pp.